Rome is one of those amazing cities where even walking the streets is an experience. There’s so much to see and do, you probably won’t see it all in one visit. 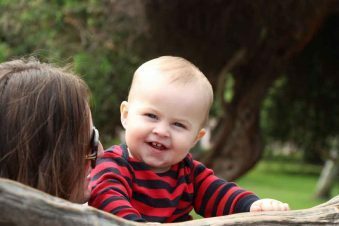 If you are visiting for the first time with a baby or toddler, you want to be prepared so you can get the most out of your visit. You’ll find everything you need to know here. 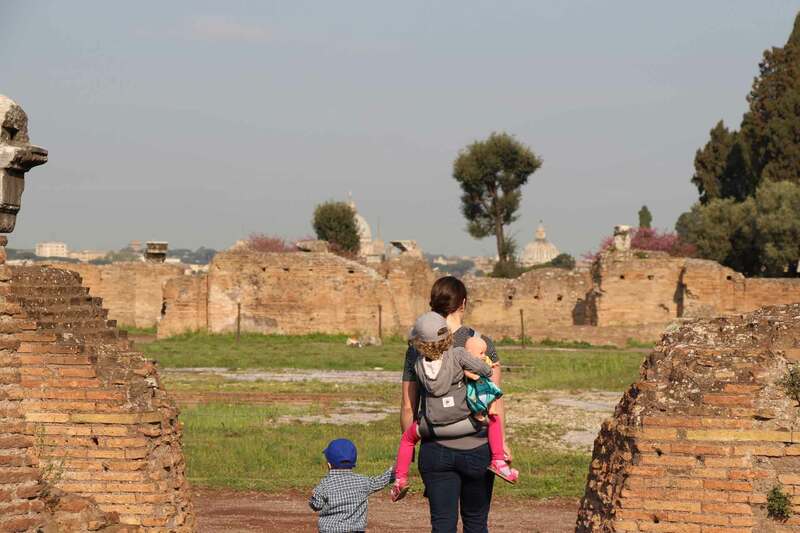 If you are traveling with older children as well, you may also be interested in our post on Rome for active families. 6 You’ve Visited all the Top Attractions in Rome, Now What? 7 Craving More Time out of the City? Head to the Appian Way! Thankfully, it is possible to get to the city center from the airport without needing to take a taxi and therefore, not needing to worry about a car seat. The easiest way is a private transfer with free child seats. 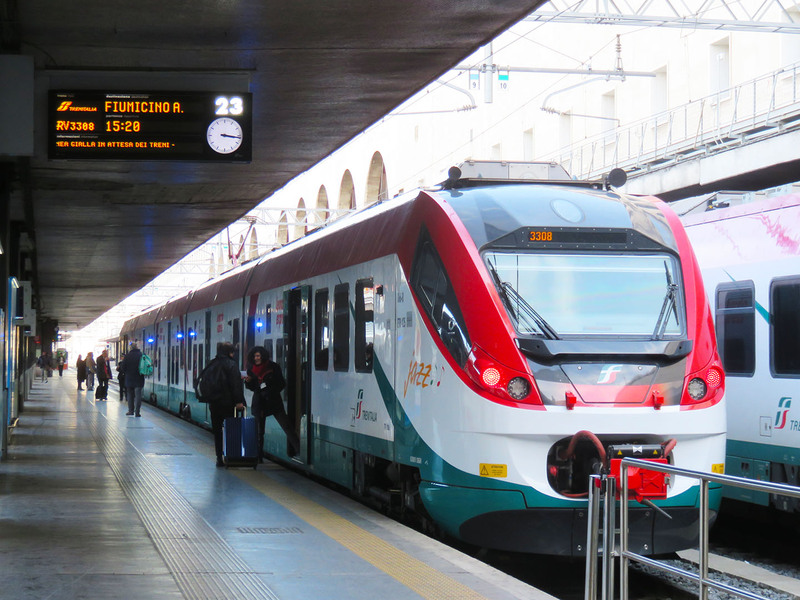 One of the most efficient ways is the Leonardo Express Train. Alternatively, if you have the time or are on a budget, the Terravision airport bus will take you to the Roma Termini for only 4 euros per person. We took the airport bus to Roma Termini followed by a local bus to our apartment. Rome is a great city to walk everywhere. There’s so much more to see and experience along the streets than just the main attractions. It’s also easy to hop on a bus to avoid long walks in the midday heat, though often quite crowded at this time. Tip: You cannot buy bus tickets on the bus. You’ll need to buy them from ticket machines (found only at busy stations) or at tobacconists or newsstands. Make sure to plan ahead. It can become a bit of a balancing act trying to find a place within budget with a couple of bedrooms and still close enough to walk everywhere. For Rome, we found an Airbnb apartment that was in the historic center. We enjoyed getting to explore the narrow, winding streets and were still close enough to walk to everything else. If we weren’t up for walking, it was easy to catch a bus. As a bonus, it just happened to be around the corner from La Gelateria Frigidarium. We use Google Maps to help us figure what we want to see and where to stay. We always try to share our recommendations on bringing a stroller vs baby carrier on our blog. It’s never a one size fits all situation, so if you have a preference for one or the other, it’s best just to know what to expect! 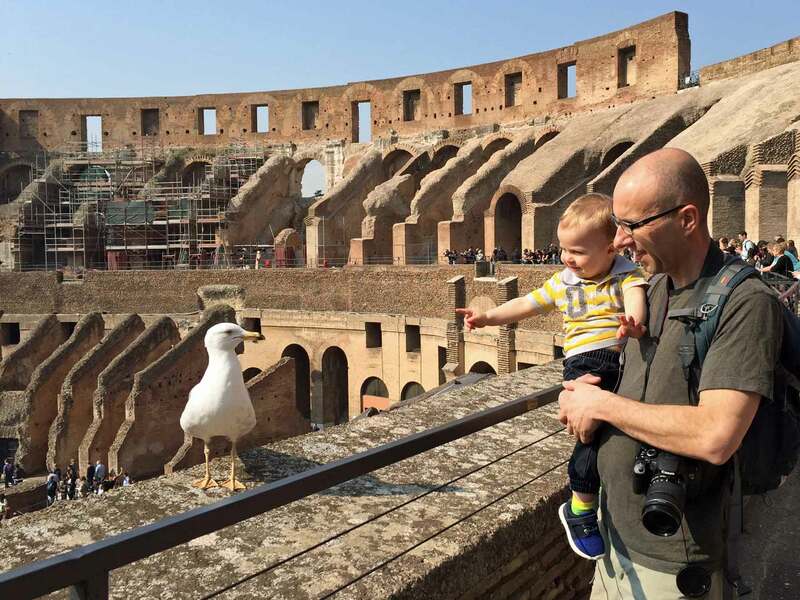 For Rome, we saw plenty of people at every attraction with strollers. We opted for carriers only, as a personal preference. Since we had planned to be more active on this trip, our backpack carriers seemed like the overall better option – even though we got quite the looks using them around the city! The Pantheon is not only the best preserved Ancient Roman Monument but it also has the largest, unreinforced dome in the world. 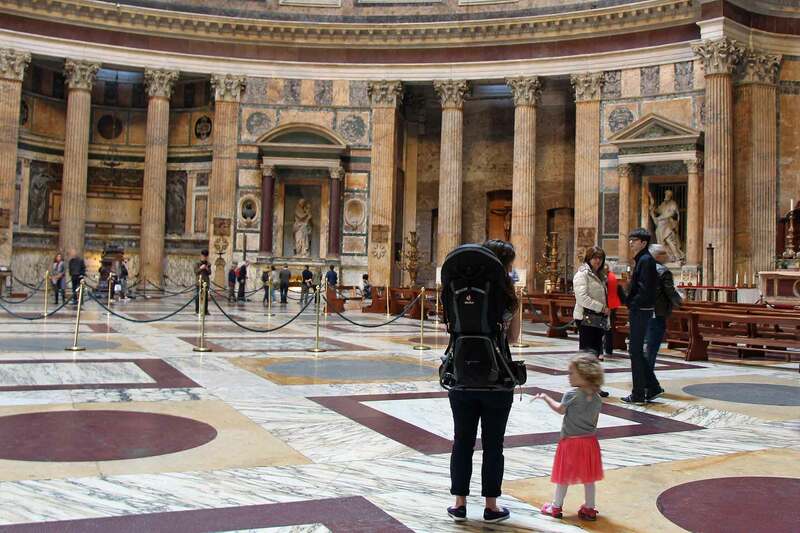 The Pantheon is completely stroller accessible. It’s pretty quick to visit, but there’s also a fountain just outside that’s great to let the little ones climb around or a good place to take a break for feeding your baby. 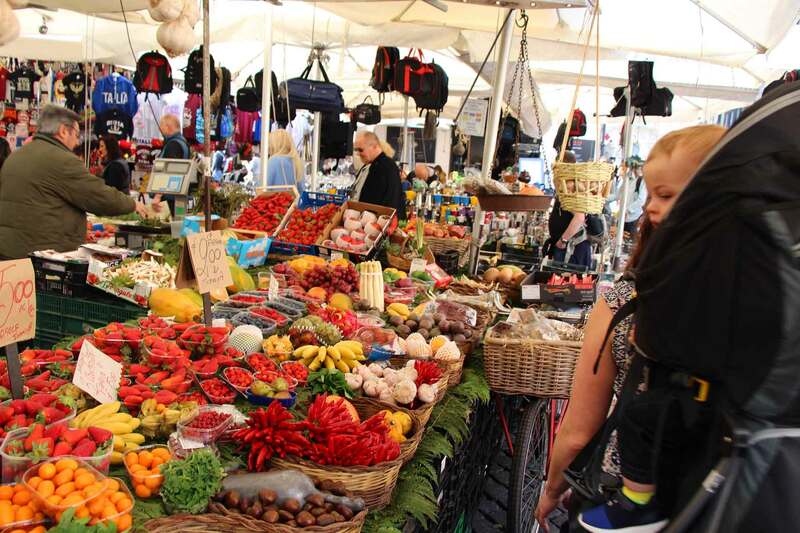 Campo de’ Fiori is home to one of Rome’s oldest fish and produce markets. Today, the market is a mix of produce sellers and stalls with souvenirs for tourists. Aside from crowded and narrow lanes, you’ll have no issue using your stroller here. There are plenty of cafés all around the market, which make a great place to stop for a cappuccino and also to feed your baby. Food tip: Stop at Forno Campo de’ Fiori in the NW corner of the market for some pizza Bianca. 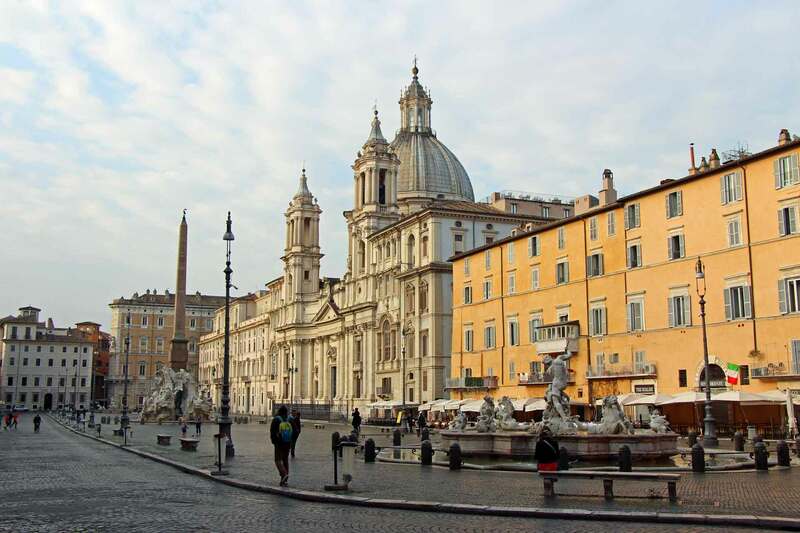 Piazza Navona is arguably Rome’s most beautiful piazza and one very lively square. Though very crowded in the afternoon, it’s a great place to have some gelato and people watch (or chase pigeons, as was the case for our little ones). If you are staying nearby and have a chance to visit first thing in the morning, you might just find it empty! Either a stroller or baby carrier will work fine here. 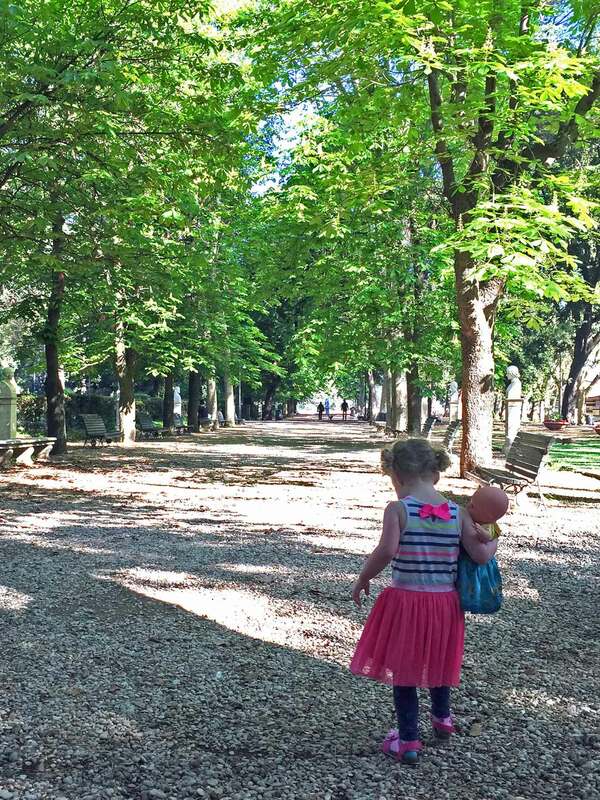 If your little one is on the move, they will most likely want to get out to explore. Food tip: La Gelateria Frigidarium is just up the street. 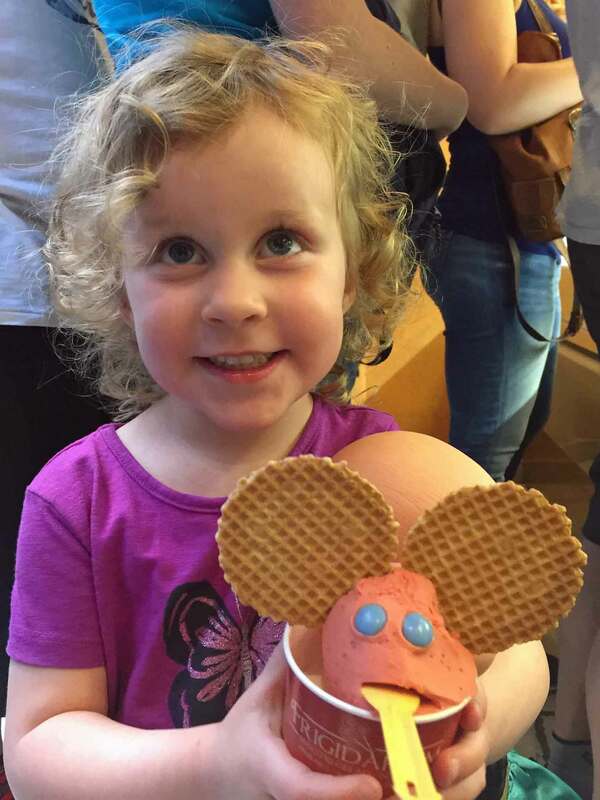 Don’t forget to get your cone dipped in chocolate! 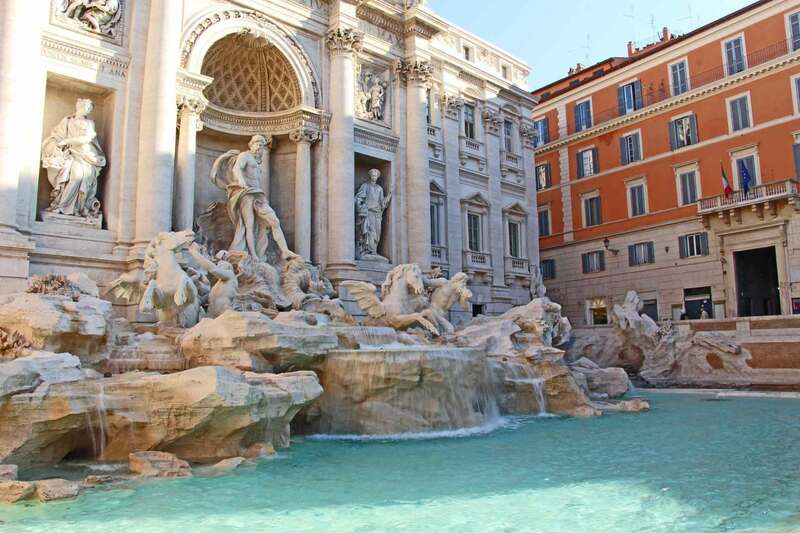 Fontana di Trevi or Trevi Fountain is claimed to be the most beautiful in the world. Legend has it that if you throw a coin with your right hand over your left shoulder into the Trevi Fountain, it will ensure you come back to Rome one day. Getting to the fountain is completely accessible with a stroller, but depending on the time of day, you might find it to be very overcrowded and won’t be able to get down the steps to the fountain with your stroller. 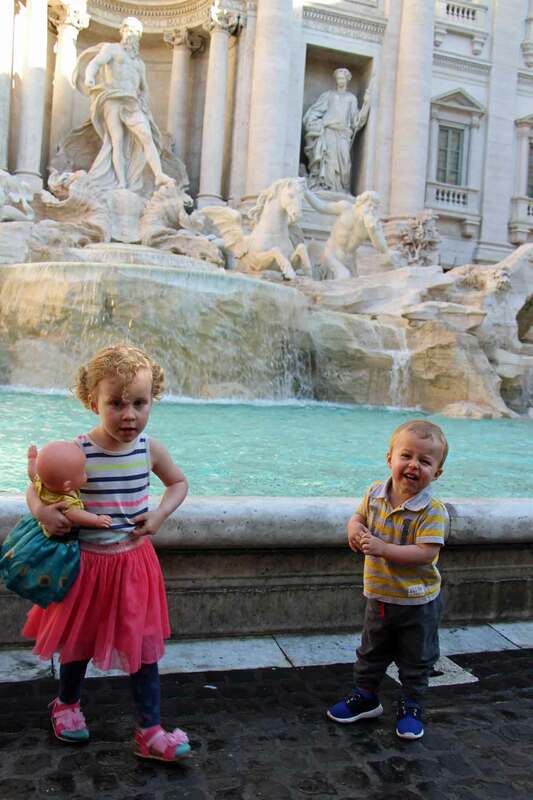 After a very busy experience with the Spanish Steps, we planned to visit the Trevi Fountain as early as we could. We managed to get there around 8:30am, and it was already getting busy but nothing like the horror stories we had heard from other travelers. We had the kids in the backpack carriers which we just left up top while we took them down to see the fountain (you could do similar with a stroller). 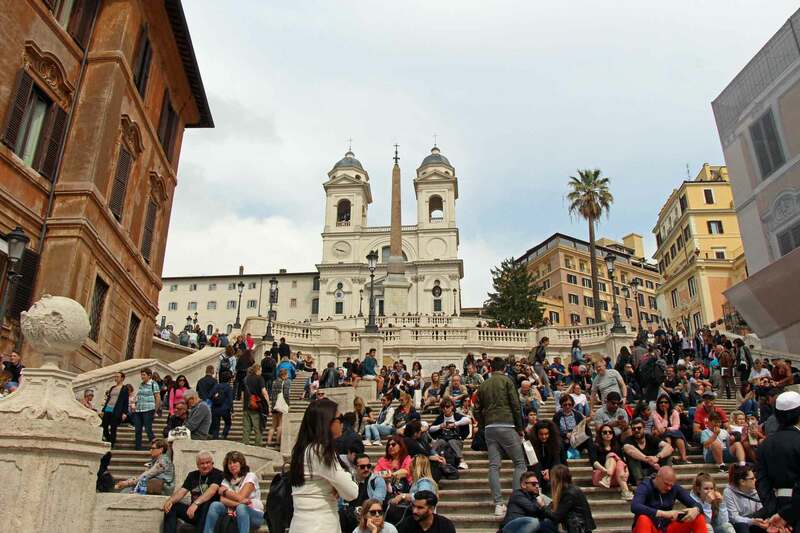 The Spanish Steps are such a popular meeting place and people watching place, that you can expect to find plenty of people around. 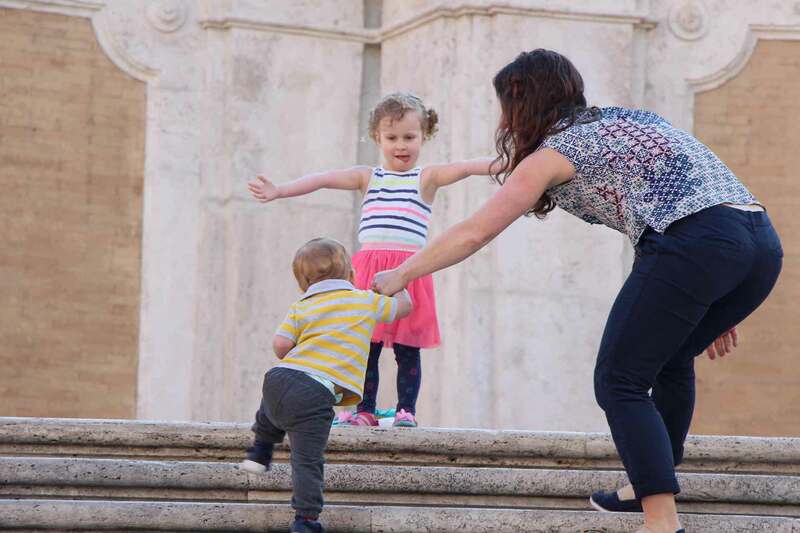 In the mid-afternoon, you’ll find the Spanish Steps to be terribly crowded and we wouldn’t recommend bringing a stroller here. You won’t enjoy climbing the 135 steps carrying your stroller through the crowd. 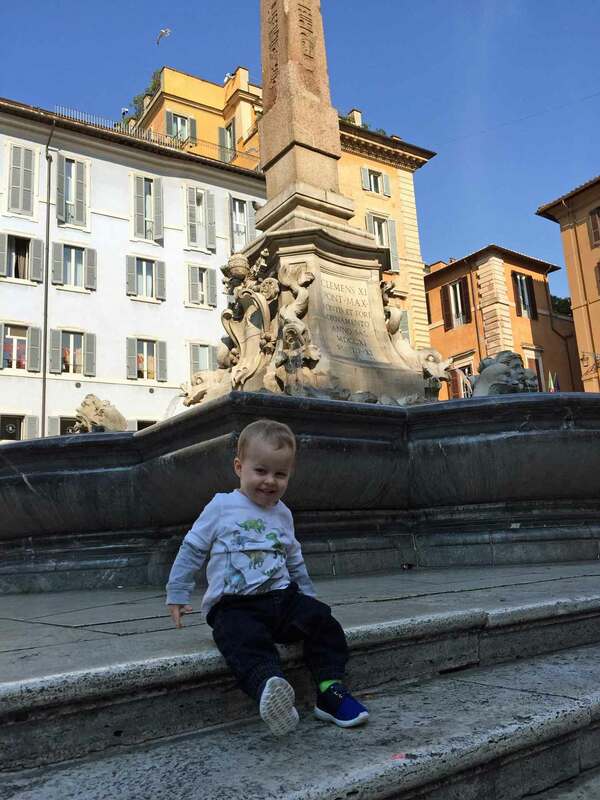 If you have your stroller and don’t want to climb the steps, we’ve read that you can find escalators at the metro stop for Piazza di Spagna, but have not personally tried this. If you visit earlier in the morning (i.e. before 9am), you will find them to be significantly less busy. Food tip: Pastificio on Via Del Corso, a pasta store, serves up delicious pasta dishes for only 4 euros starting at 1pm. Perfect to bring home. Keep in mind, you are not allowed to eat on the Spanish Steps. 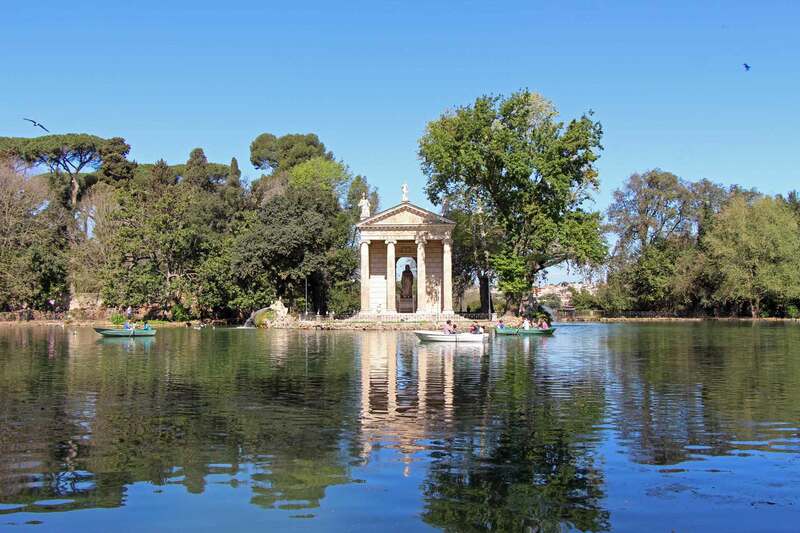 The Villa Borghese Gardens are the third largest public park in Rome. It’s a nice short walk here from the top of the Spanish Steps. If you are looking for shade, a place to feed your baby or a quiet spot for a nap on-the-go, this is where you will find it. It’s the perfect spot for an escape from sightseeing and crowded tourist attractions. The Giardino del Lago is a beautiful shaded area with plenty of benches to stop at. You won’t have any issues with a stroller here. 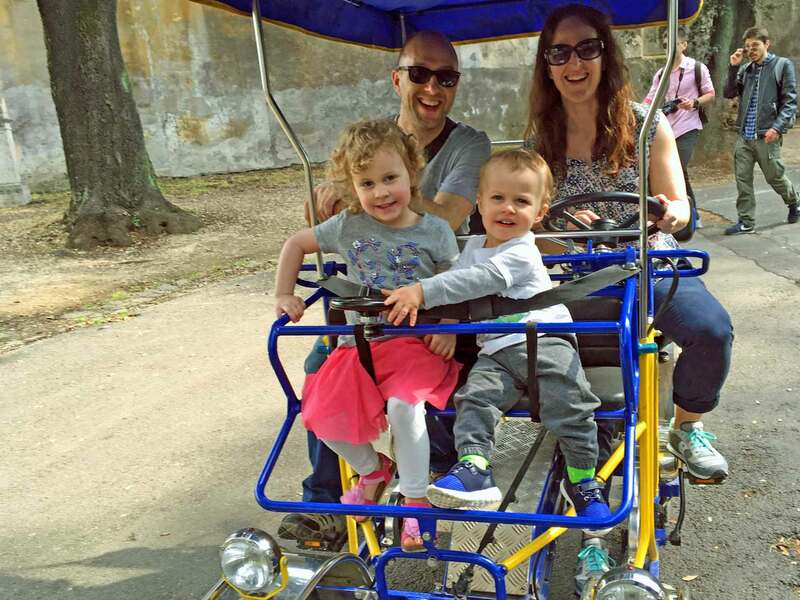 If you are looking for a fun activity in the park with your little one, you can rent a surrey bike. Toddlers and preschoolers can sit up front while you pedal through the park. Tip: Take a minute to look over your bike. Ours had a safety buckle to help keep wiggly toddlers in but not all the bikes had them. 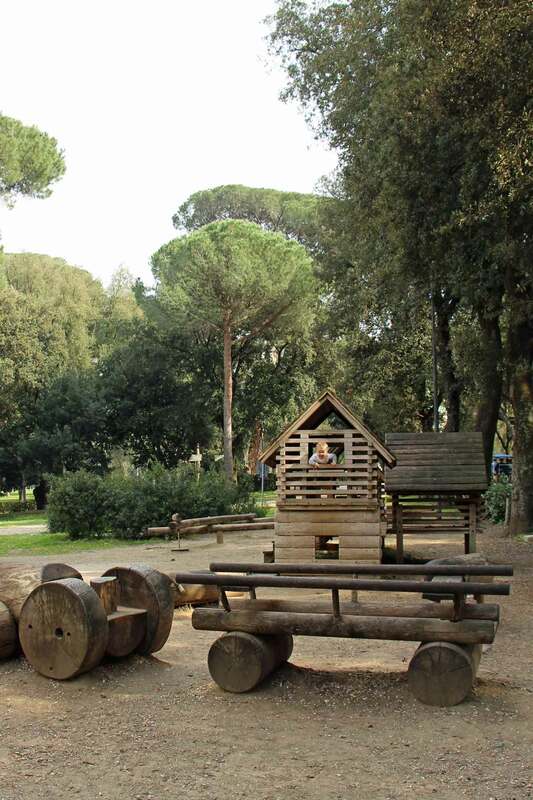 If you are looking for a place to give your baby or toddler time to play see our post on playgrounds around Rome. Easily one of the most recognizable monuments in Rome, the Colosseum is a must visit. We recommend you buy your tickets online and try to get there when it opens. We also suggest visiting with a baby carrier. We saw plenty of people visiting with their strollers, so there’s no issue bringing one but you’ll be able to get around easier with your baby in a carrier. If you do bring a stroller, make sure it is a small lightweight one. The first level can be very busy and crowded. There is a lift to the 2nd level and a wheelchair friendly route, but if your stroller is lightweight you can probably just carry it up the stairs. 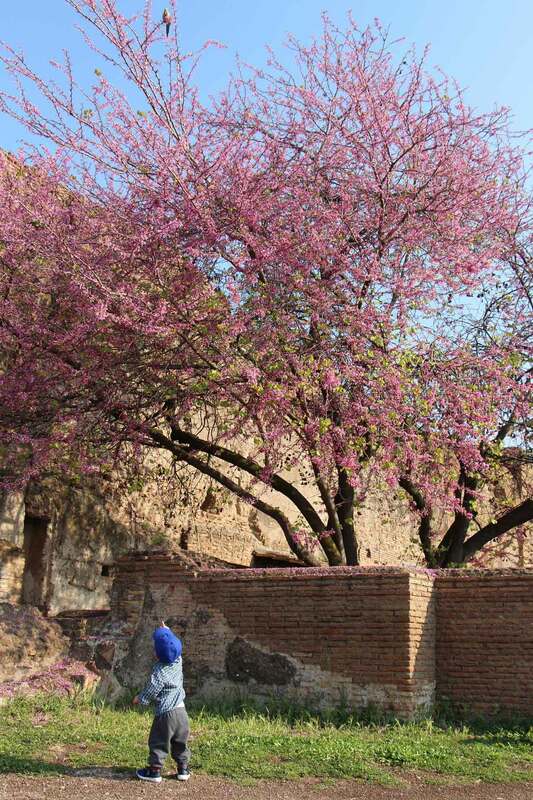 Palatine Hill, one of the Seven Hills of Rome, and the Roman Forum, a rectangular plaza surrounded by ancient ruins, will easily take you a few hours to visit. Palatine Hill is a great spot to let small children burn off some energy and it has some great views of the Roman Forum below. Visiting the Colosseum, Palatine Hill & the Roman Forum all in one day will make for a very long day. We split it up over two days and are glad we did. It allowed us to visit the Colosseum when it opened and on our second day, we were also there at opening and had Palatine Hill mostly to ourselves. 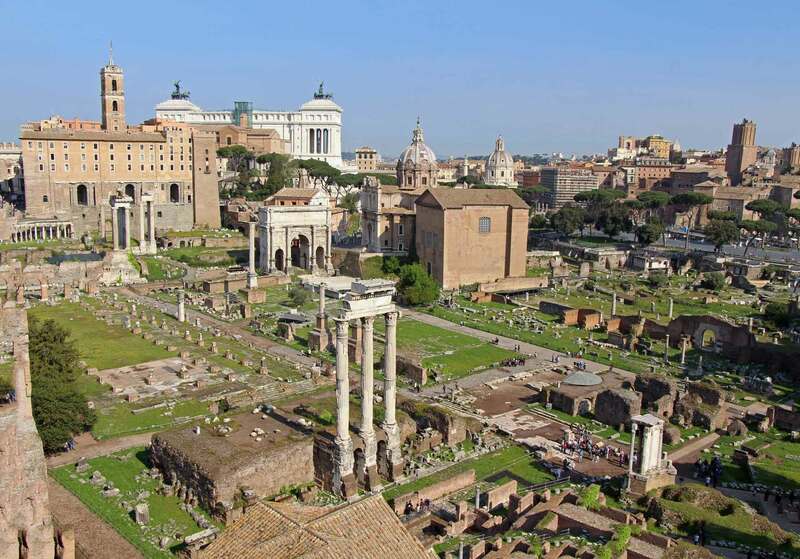 However, we would recommend visiting the Roman Forum first since it does get quite busy. 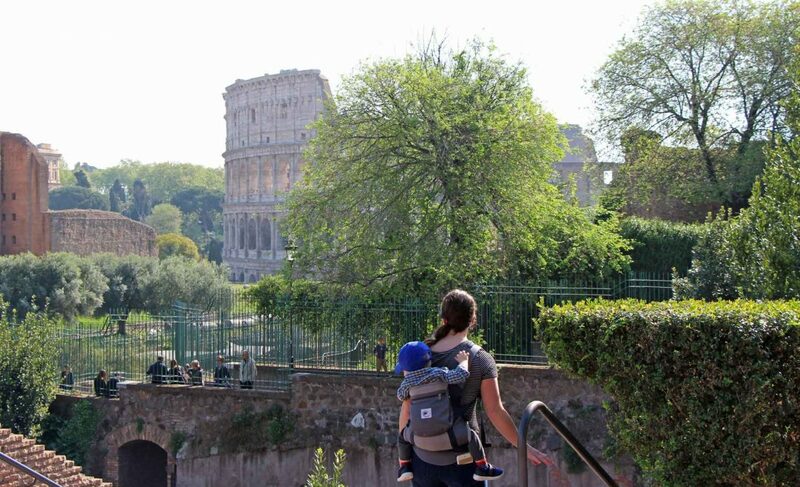 You will be able to navigate much easier between Palatine Hill and the Roman Forum with a baby carrier, especially when it starts to get crowded. There are stairs, with some being quite steep, between Palatine Hill and the Roman Forum. If you want to bring a stroller, we recommend also tucking your baby carrier at the bottom of your stroller. If you want to climb down any of the steep stairs, you can take your baby out and carry your stroller down. 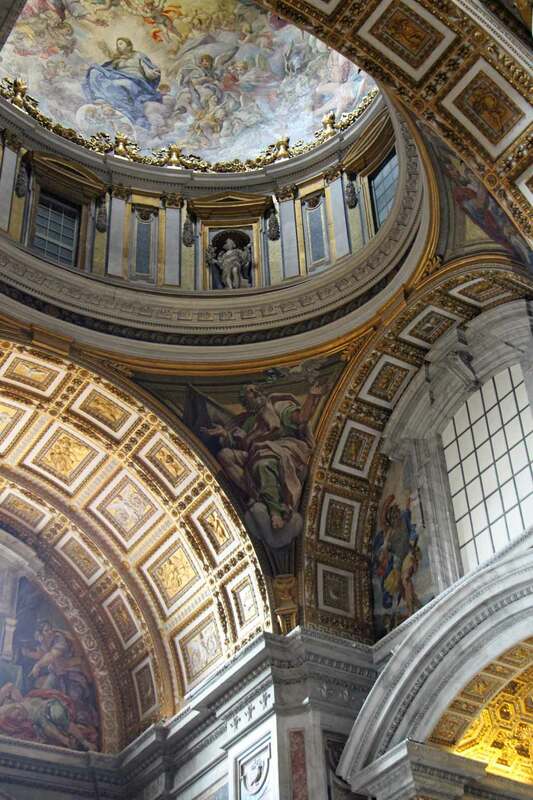 Even if you decide not to visit the Vatican Museums, it’s worth a stop to St. Peter’s Basilica. The line to get in is usually a lot shorter. Plan to bring a baby carrier along if you decide to visit with a stroller. 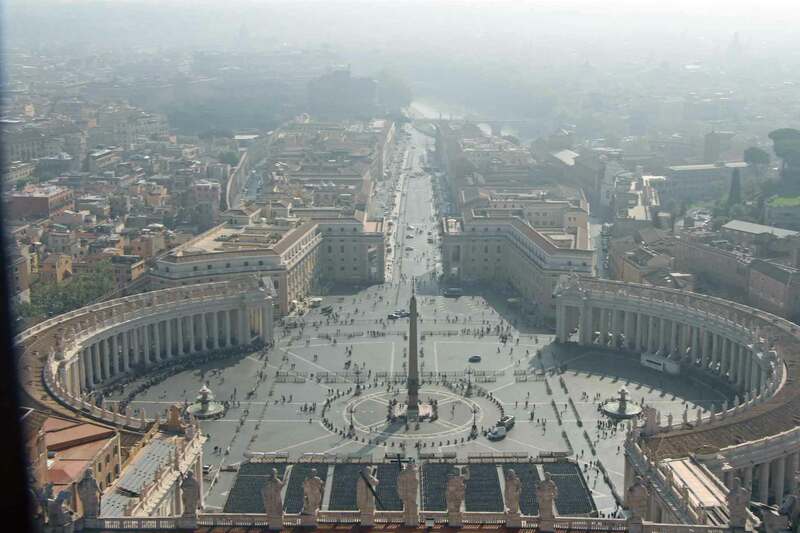 Strollers are allowed in the square but need to be checked before entering the church and you’ll want the carrier if you plan to climb St. Peter’s cupola (dome). 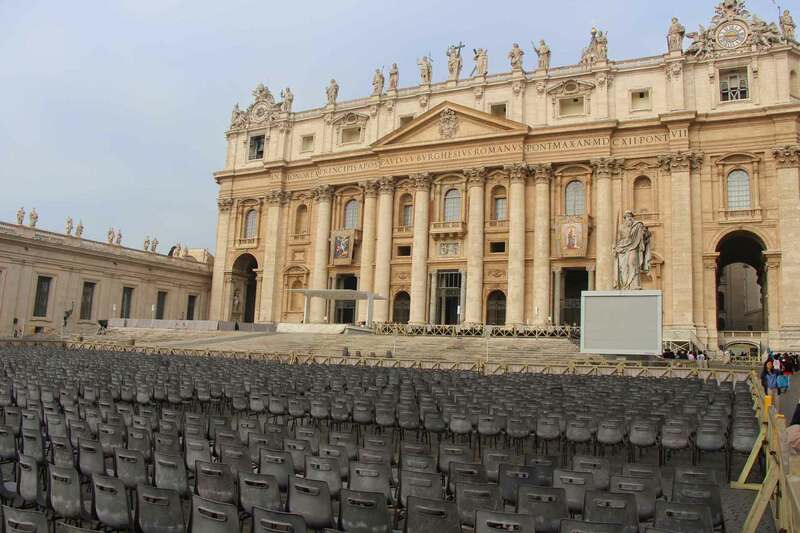 For more information on visiting Vatican City with kids, read this post. On our last day in Rome, we opted to skip the Vatican Museums as we hadn’t purchased advance tickets and weren’t really interested in spending so much time in line. 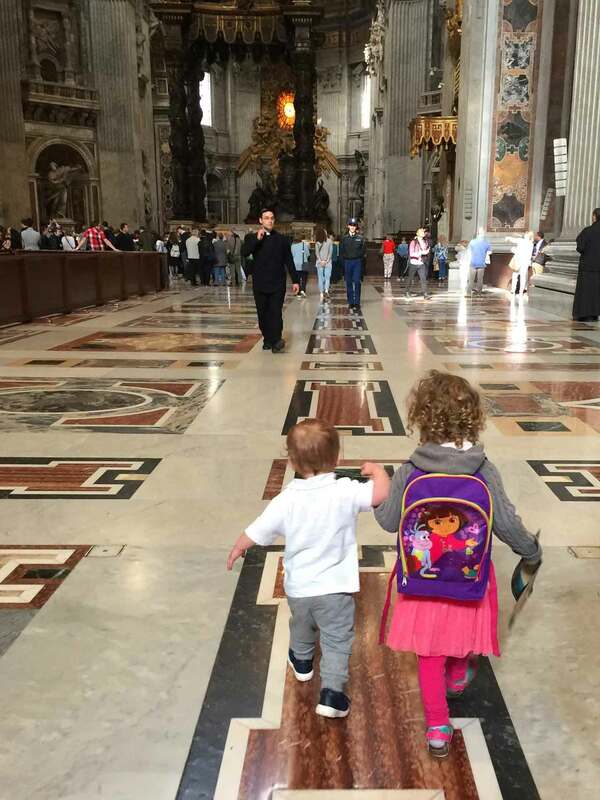 Interestingly, we were allowed to keep our backpack carriers on when we entered the church and for climbing the dome. We were originally told we had to check them at the coat check, but one of the guards ran after us and told us that we could leave them on. We were able to keep them on during the security check and the guards just searched the pockets in the back of them. 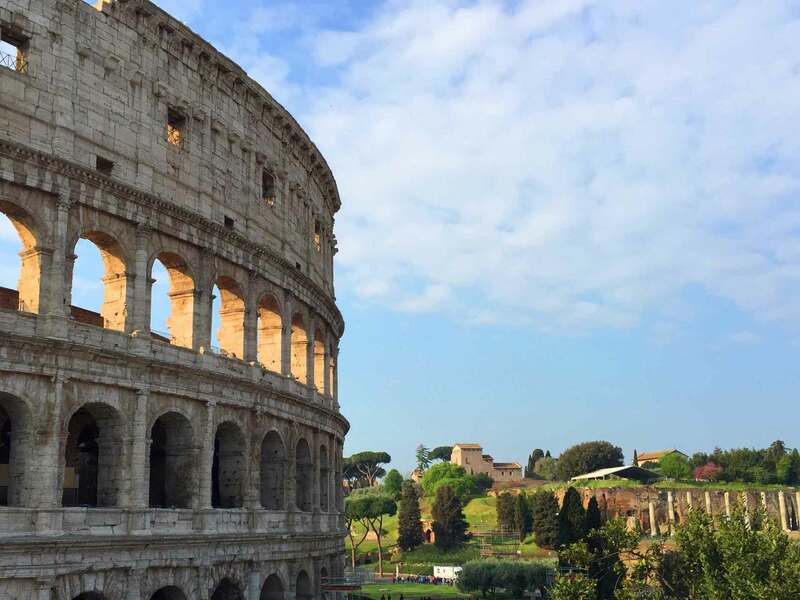 You’ve Visited all the Top Attractions in Rome, Now What? We would highly recommend visiting the Aqueduct Park. You’ll need to take the metro to get there as it’s about 8 km from the center of Rome, but it’s really worth the time. Not only will you feel re-energized from being away from the crowds and traffic, but you’ll get to marvel at the engineering skills that went into building the aqueducts that brought millions of litres of water into the city each day! You could bring a stroller here, but expect to carry your stroller on stairs at the metro station (in case any escalators/elevators are out of service) and over some stairs to get to the paths. The dirt paths can be narrow at places so a stroller may restrict where you go. A baby carrier or backpack carrier would be a better option. There is also a playground on the way to the Aqueduct Park that you can stop at. Craving More Time out of the City? 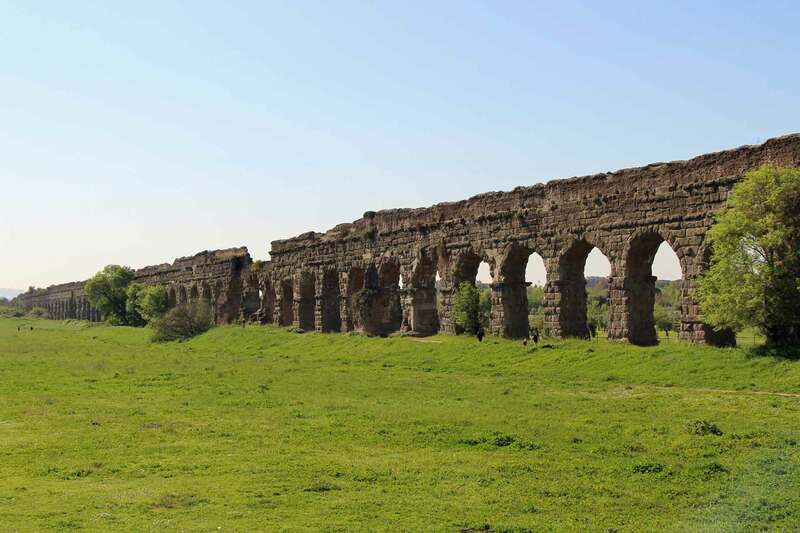 Head to the Appian Way! You can either walk or even rent a bike! We were able to get baby/child seats and helmets from @ecobikeroma. 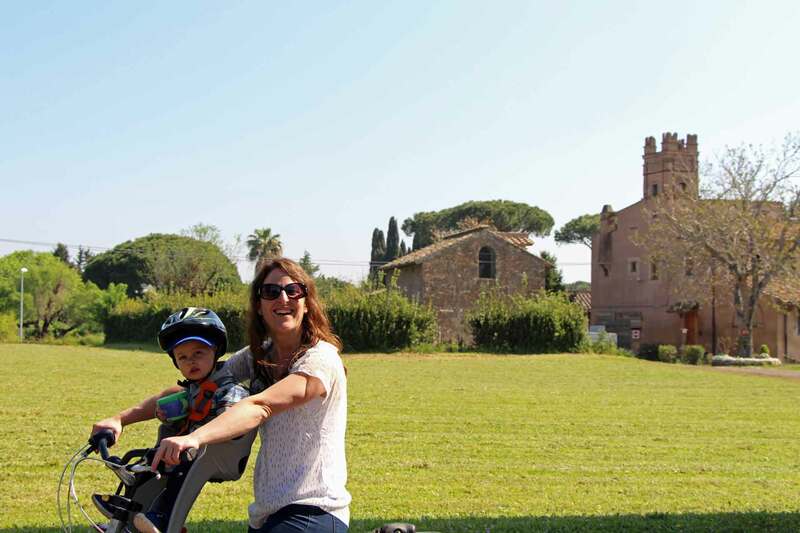 We were lucky enough to visit the Appian Way with fellow family travel bloggers @jakeanddannie. They wrote a post that perfectly sums up the great time we had on the Appian Way with them here. The first bit of the bike ride was a little busy with traffic, but once past that point we were on a very quiet road with only the occasional car. We kept our bike ride short and opted to allow the kids to run and play instead. The kids loved the bike ride and loved running up and down the path even more. If you want a nice walk out with your baby in the stroller, this would also be a great place. There weren’t any benches that we saw to stop and feed a baby but there is a café right next to the visitor center which would be a great place to stop. Travel High Chair – Some restaurants have high chairs, but they may only have one or two. We travel with the MyLittleSeat since it’s so small and we can carry it around with us during the day. Change mat – bring a portable changing mat with you as you aren’t likely to find changing facilities. Baby Carrier – Bring a baby or toddler carrier. Even if you bring a stroller, having a carrier will be useful and we recommend bringing it as well. Stroller – Use a small lightweight stroller that you can easily carry up stairs or that will fit in restaurants. Diapers/Wipes – Diapers and wipes can easily be found at pharmacies and supermarkets, so only pack enough to get you through until you can get to the supermarket. Baby food – Also available in supermarkets. The last piece of advice we’ll give on Rome is to get out early if you can. Thanks to jet lag and a toddler who wakes up early regardless, we got to have experiences like seeing Piazza Navona almost completely empty. We ended up visiting the Spanish Steps a second time and you can see the difference 9am vs mid-afternoon makes! 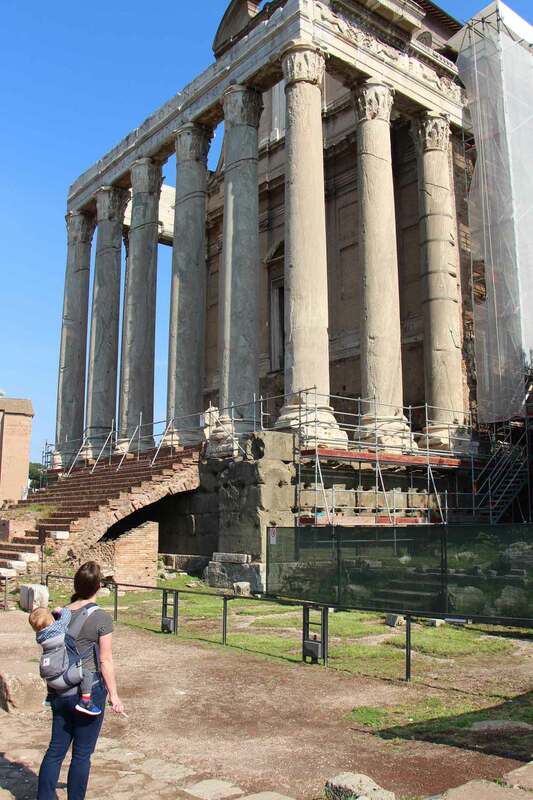 When we visited Palatine Hill and the Roman Forum, we loved how quiet and peaceful it was up on the hill but in hindsight we would have visited the Roman Forum first because by the time we got down there it was very crowded. 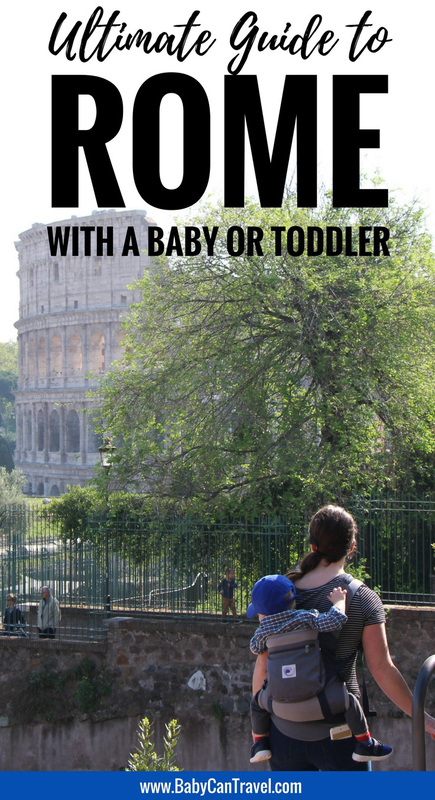 We’re travelling to Rome and Pompeii in a few weeks with a big (26lbs) 13 month old. We’re trying to decide whether to buy a carrier for the trip. Did you have problems with sights not allowing backpacks – I’m concerned about Vatican museum, Borghese gallery etc. Thank you for this post! 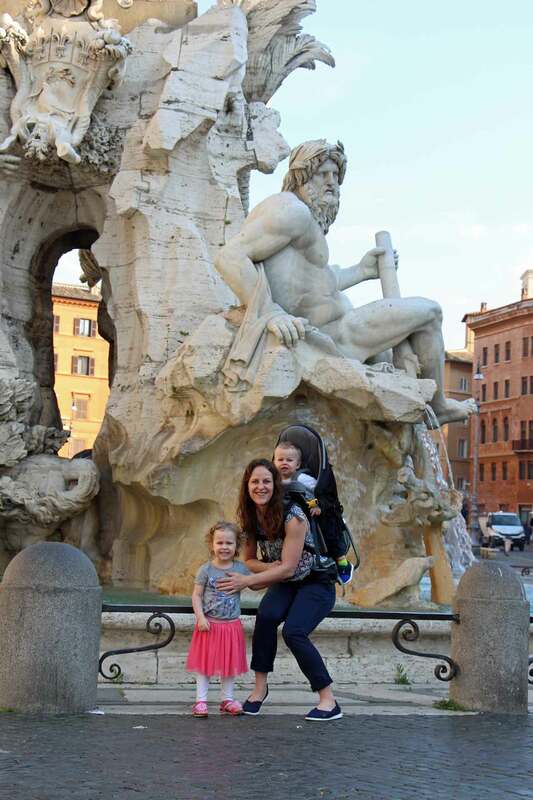 We are spending a day in Rome with our three young kids (6,3,1) and are planning on having a hiking backpack and an ergo carrier. 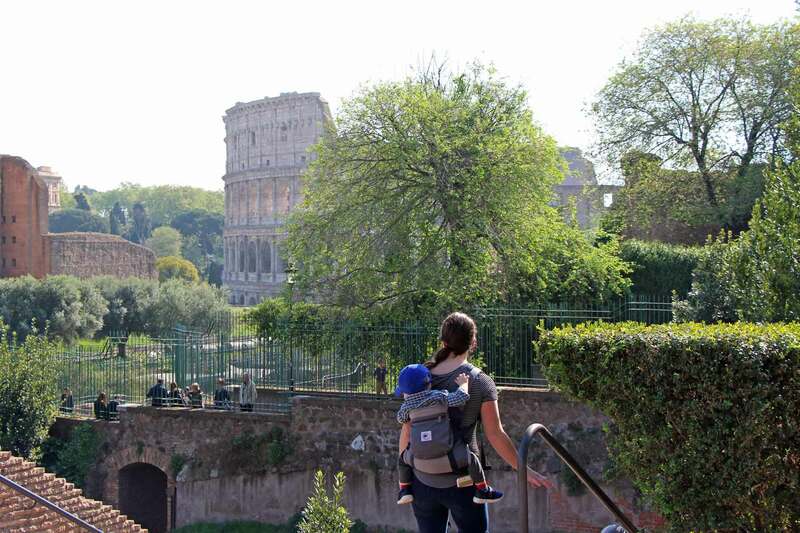 Were you able to take the hiking back pack to Roman Forum and Palatine Hill? 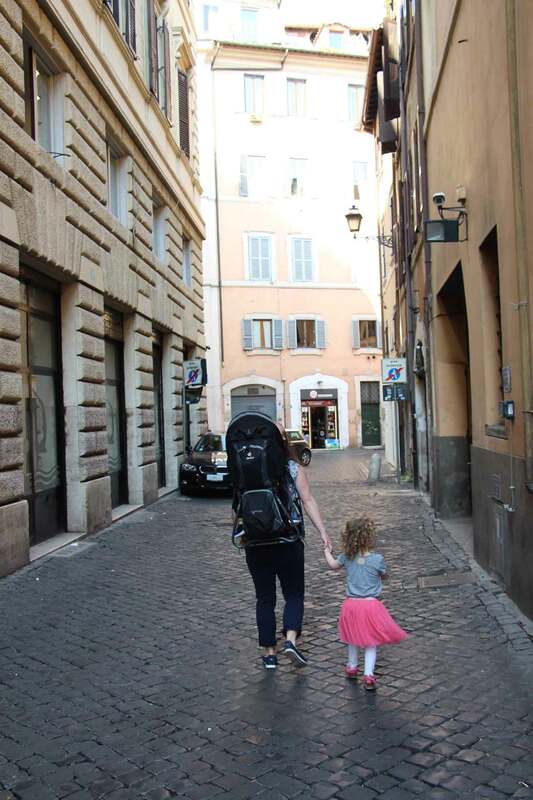 We also had an ergo carrier with us, so we brought that to the Roman Forum & Palatine Hill instead of the backpack carrier. 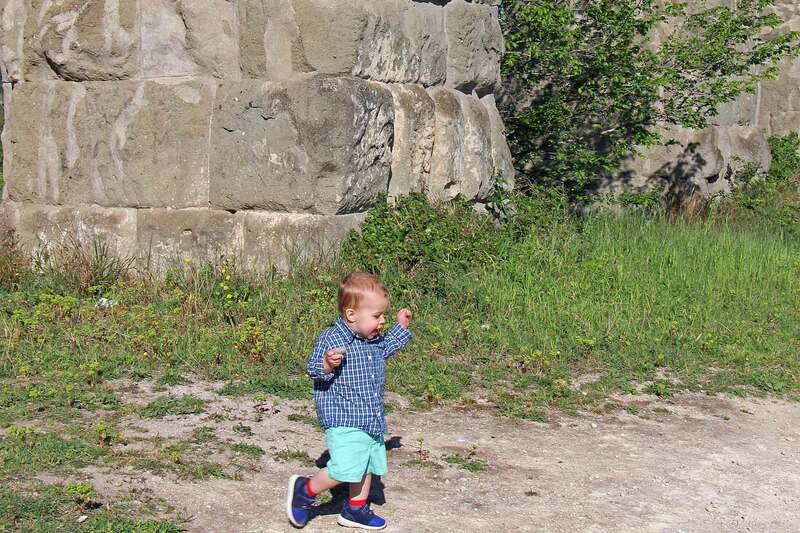 Our 14 month old walked most of the area around (It was a great spot to let him explore, especially Palatine Hill). Sorry, let me clarify, by hiking back pack I mean a large backpack baby carrier!